In June of last year I received a direct contact from Ishikawa of AIU, and told me that I would like to do an internship at our company. Therefore, we proposed a long-term problem-solving internship from our company, and decided to work on appropriate inheritance of historical culture due to the decline in recognition of Nobe legend transmitted to Iwasaki area and lack of intergenerational interaction. There was a strong team that could mutually complement each other’s three issues of students, businesses, and administration with the cooperation of a mentor etc. 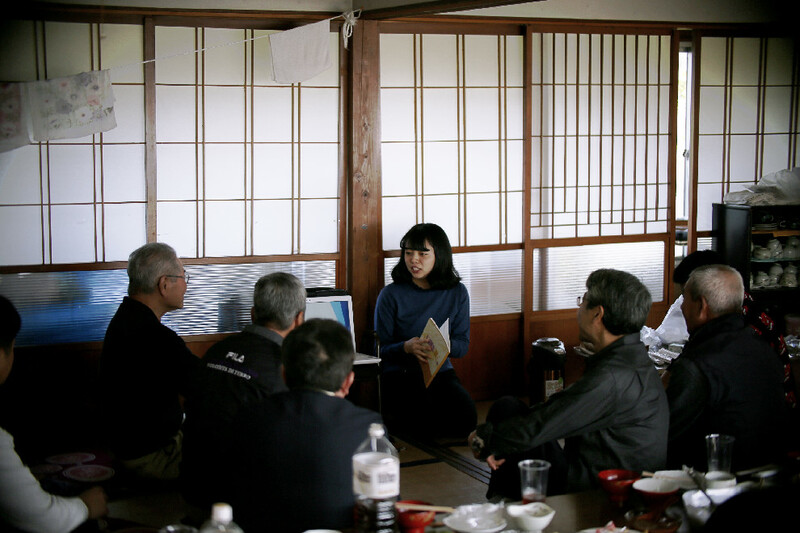 by Ms. Toyodome of the Yuzawa area community revitalization cooperation team. At AIU, we regard internship as an opportunity to learn the way of organization and the way of thinking of working people by actually working students and thinking about their career, and granting credits according to the length of the internship period, etc. Support the positive activities of There are also some internships mediated by universities, but in many cases students themselves find internship destinations. 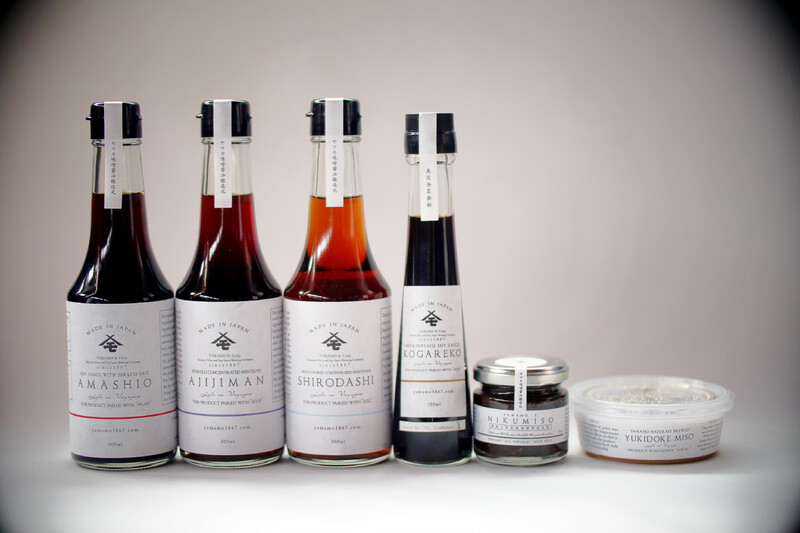 One such ambitious student, Hyuga Ishikawa (second year), is said to make a regional contribution at the Takamo Joint Name Company (Brand name: Yamamo Miso and Soy Sauce Brewing Company) from Yuzawa City, Akita Prefecture, from June to October 2018. I worked as an intern from the cut end. Students introduce their internships in a proactive manner as an example of their activities through the story of Mr. Ishikawa. Q: What led you to take part in this internship? 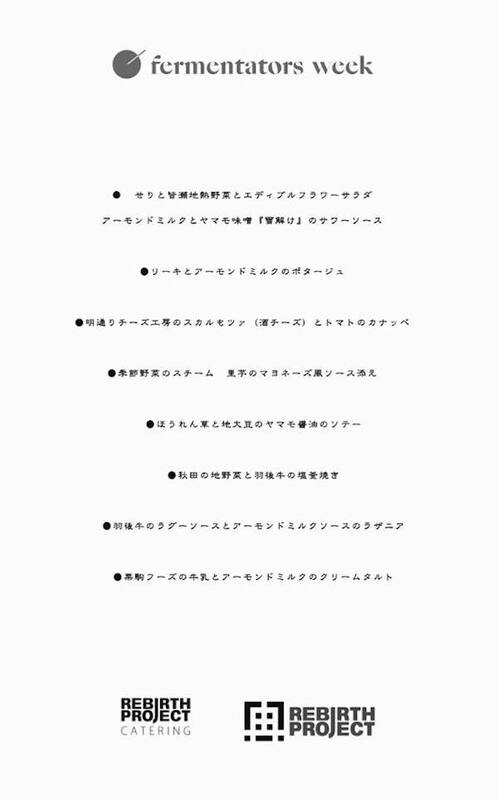 A: Born and raised in Akita Prefecture, where population decline and economic downturn continue, I have been interested in activities such as “Machi Okoshi” since I was in junior high school, and I want to try “Machi Okoshi internship” at the timing before studying abroad. It was When I consulted with the university’s career development center, I immediately got in touch with the fact that there is a manager who has an interesting activity in Yuzawa, Akita Prefecture. After that, the talk went more smoothly than I expected, and I participated in the internship within one month from the first contact. Q: What kind of activities did you do? A: In the Iwasaki area in Yuzawa, Akita Prefecture, residents have lived for many years, with the Minase River flowing through the area. Despite having traditional events such as river legends and festivals in the area, swimming in the river was banned, and as the population declined further, now the legends and related events are becoming obsolete. Meanwhile, Yamamoto miso soy sauce brewery former seventh Taisho Takahashi in Iwasaki stands up to leave the history and culture of the region for future generations. 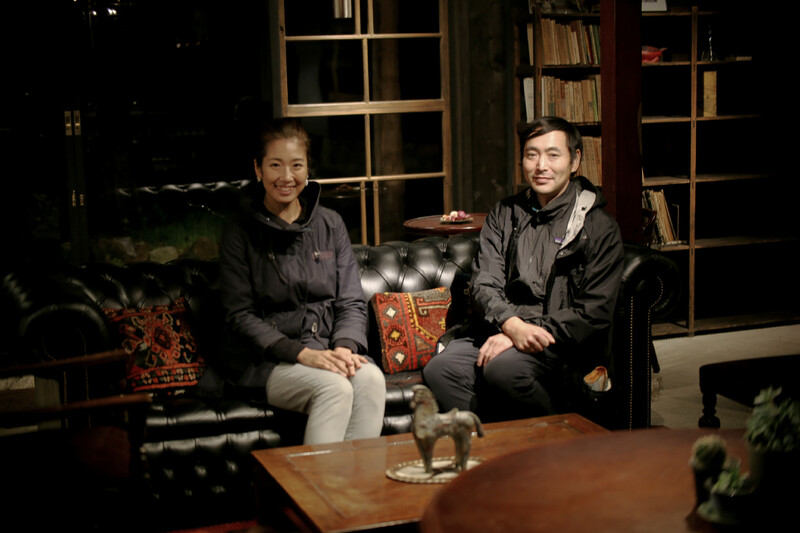 Mr. Takahashi saw the scene where the community was revived and restored by art through the experience of traveling abroad, and using that case as a model, he thought that he wanted to leave the culture and customs in the same way in the town where he was born and raised. This time I was blessed by the fact that when he started his activities and when I challenged the internship happened to coincide. So, as an assistant to Mr. Takahashi, I came to collect information on Iwasaki’s history and culture. At first, the primary purpose was to create an art gallery that represents the history and culture of the area, but through the encounters with various people, the goals of the activities diversified. It was an organic internship in which students focused on finding and solving new issues, regardless of their purpose or conventional internship type. Q: Have you had any particular impressions? A: The impressive point of this activity is that I, as a student, was able to objectively look at the current situation in the area, and to consider issues and concrete solutions that accompany it. Compared to regular internships, I was given a variety of challenges. About two months after I started my activities, I discovered a new issue: connecting management and employees. It was more difficult than expected to have many employees understand the innovative and creative activities of the management. However, when I was in charge of planning and managing information sessions for employees and creating materials, I was able to realize that the company was well-understood. Being able to experience an internship that requires a flexible response in a timely manner as such, and being able to lead to a solution to a problem discovered by myself, have a major impact on my future work style. Q: Please let us know what you realized or wanted to convey through your activities. A: In addition to the initial goal of the art gallery, the internship conducted with the issue of organizational development is very different from the simple “machishining” I had in mind when I was in middle school, and I often got confused by the gap. was. The activity to bring vitality to the area and the town is not sustained by single-person efforts by external personnel. It is also important to bring new ideas and ideas from the outside into the area, but at the same time I felt that it is also necessary to respect the values and customs rooted in the local community. Through this internship, we were able to realize the importance of engaging in action with the local residents and involving the entire area. 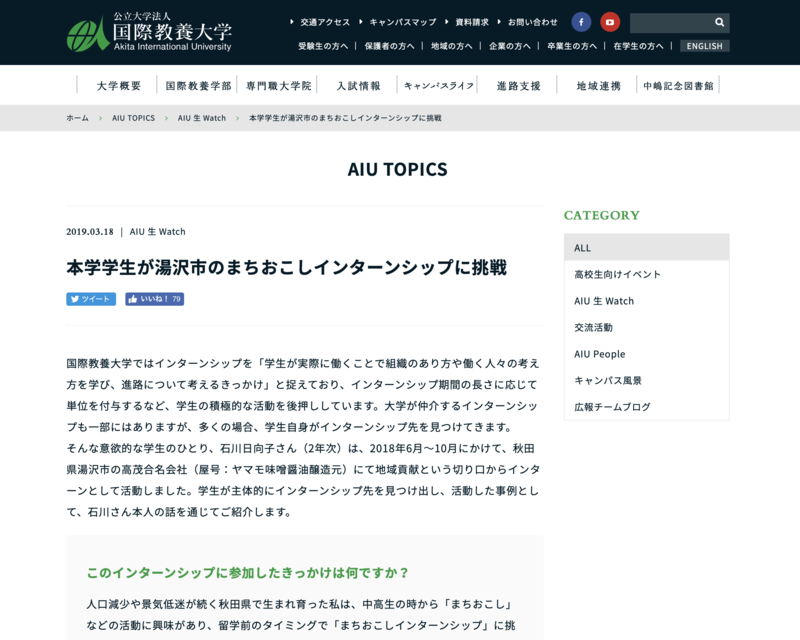 There are many students who want to take the lead in internship at AIU, but I think the first problem they face is that they can not find an ideal internship destination in Akita Prefecture. Certainly, compared to urban areas, there may be less companies doing advanced activities and companies that frequently accept interns. However, according to the words “You can do the job you want, you can make it locally”, which is the key word in this internship, the scope and goals of the activity can be expanded to any extent, depending on the student’s own motivation. While there are many problems in rural areas, there are also many undiscovered local charms and potential human resources. Looking at them from an objective point of view and taking action to improve the current situation in the area is a very interesting and challenging thing. I would like to convey that I can make a job depending on my own actions without grasping the point that I live in Akita Prefecture. We had Yamamoto’s products selected from the viewpoint of “condiment that makes cooking fun” to the sales application · Komerko that the online recipe site-Cookpad develops. 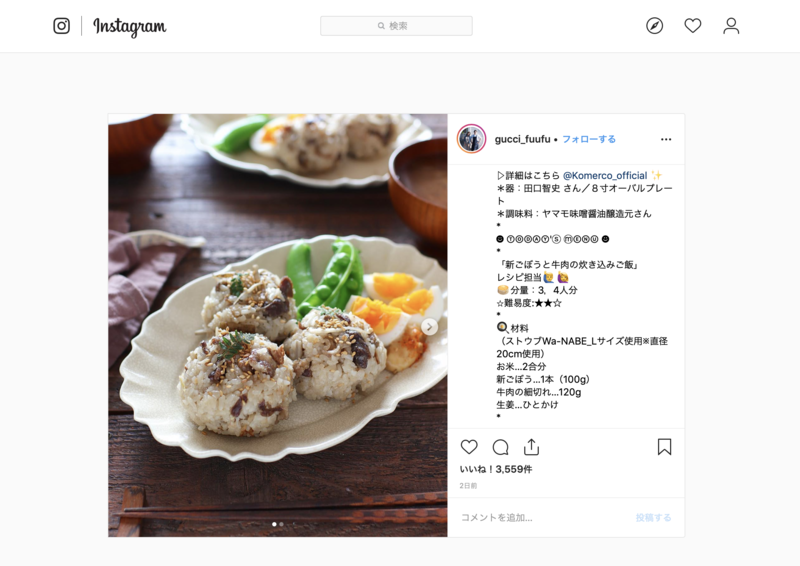 Commodo’s follow and post a luxury gift at INSTAGRAM #Spring Japanese rice A post campaign is being carried out, and Yamamo products are also introduced to the influencers. There are many suggestions for lifestyles related to food such as recipes and dishes. Please take a look at it. 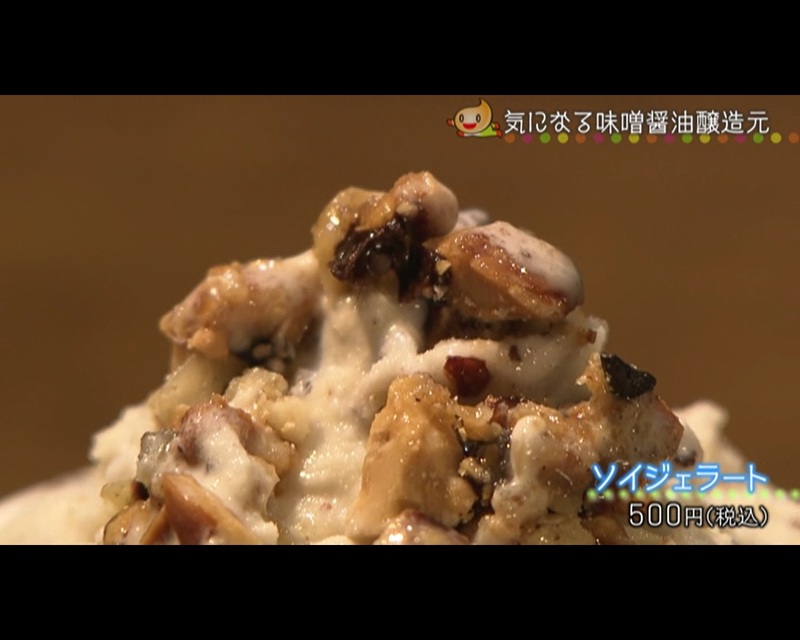 They are a cook and has various social activities, including Mr. Heita Niiro and Ms. Chie Endo. At the Fermentators Week, there was also a discussion with me, so I was able to spend some delicious time enjoying myself while using my head. During the tour, I was impressed by the philosophical thinking and the deep interest in fermentation towards going to your dish. The process of creating a new relationship of “fermentation” by the explanation of the manufacturing process in our factory and the explanation of the garden, and the question and answer session between the two people, we can talk about the social environment surrounding food and its significance. The In addition, event provided us with colorful dishes using our products, and we were able to sense new possibilities. I hope I can see you again. We look forward to seeing you again. Born in Kagoshima in 1995. Joined BeGood Cafe as a DJ in 2000. 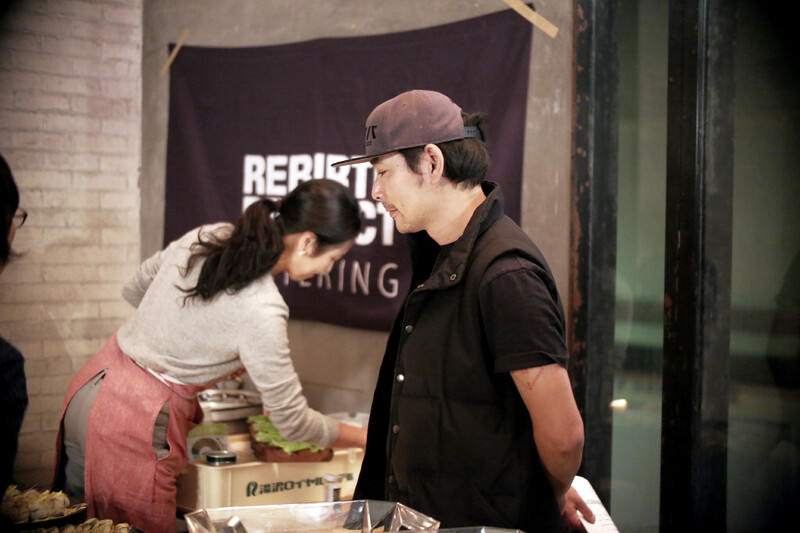 After that he became food team leader and was in charge of kitchen management at various events such as the Aichi Expo. Served as Kofokuji CafeSlow Food Director. 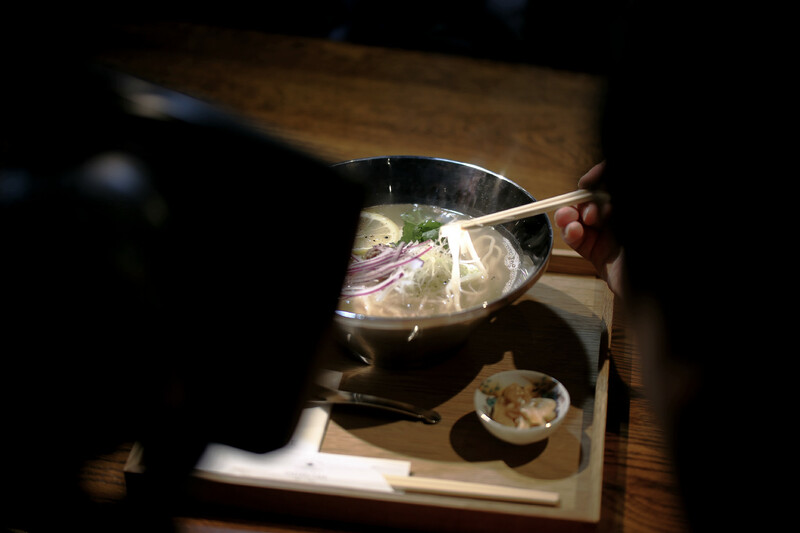 Since 2011, he has been working on food direction for Earth Day Tokyo Nichols Forest Kitchen and The ATOMIC CAFÉ at Fuji Rock Festival NGO Village. 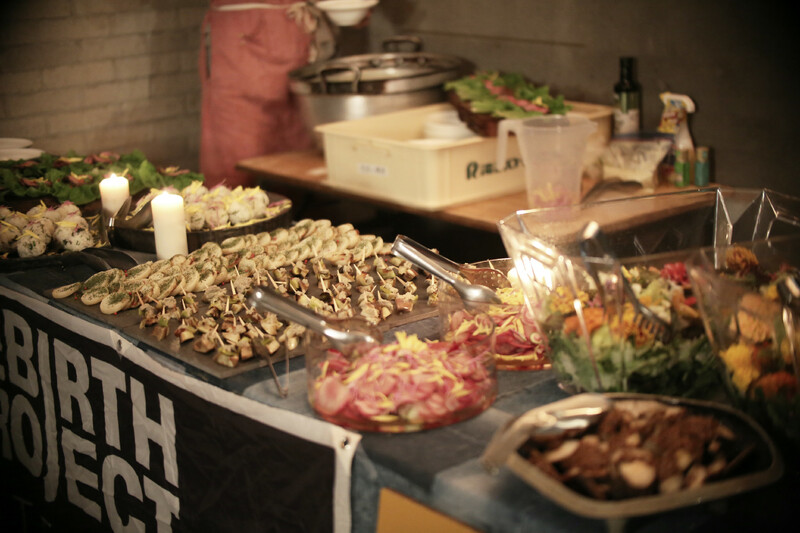 Currently, organic food catering PEACEDEL, REBIRTH PROJECT CATERING, PRBAR “Delicious Wednesday” in the Kokubunji Cafe Slow Community. Popular cook in the magazine ELLE gourmet, “ties” representative. After graduating from university, he worked as an international flight attendant, then worked as a cooking school assistant and working at a restaurant before becoming independent. 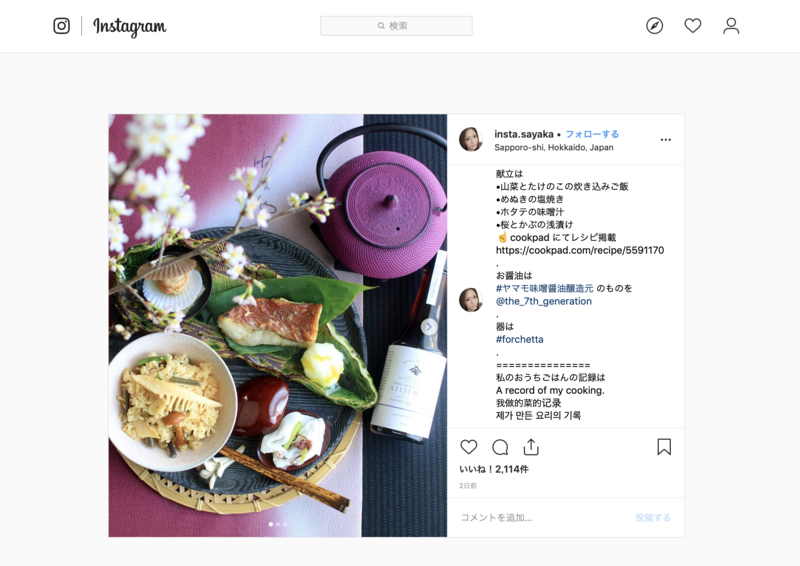 Based in Kanagawa and Nakayama, which are rich in the nature of the valley, catering, business trip cooking, and menu production are performed as “ties” that make use of the intrinsic taste and beauty of seasonal materials. Since 2016, he presides over the “Hands of Meetings” where he hand-crafts the kitchen along with the 24th season. In order to open the I.L.A. GALLERY, there was an encounter with the ONBEAT editor, Mr. Fujita, during the art activities, which led to the publication of this article. 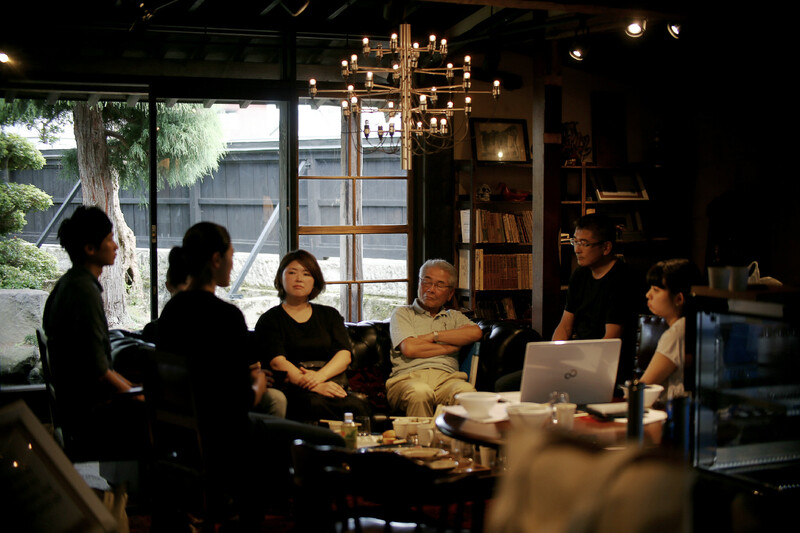 From the beginning of the talk, I showed an understanding of our activities, covering not only the gallery, but also the company’s rebranding and overseas development, and the inbound tour that followed the Iwasaki area and the legacy of Mosuke Takahashi of each generation. Thank you. Of course, I was able to share a lot of ideas about art and the perspective of Japan in the world, and I had a very interesting time. The delicate and unique sense of Japanese people can create value in the world and enrich the world. By digging carefully into the context rooted in the land and spinning it, we can make the region a sustainable and creative land for the world. There is still much we can do, and doing it can make the world more interesting. It’s industrially as well as art based and it’s sensibly equivalent, and the creation area jumps the fence and changes the world. Mr. Yasushi Takahashi, young the 7th generation of miso and soy sauce brewing company Yamamoto, who has a long history, succeeded in branding and renovation of his company with excellent artistic sense and management skills, and made use of his know-how to move forward with promoting renovation in the area You are In each region of Japan, there is a unique and rich culture that continues in a row, and Takahashi’s activities that are struggling in the local area, Akita, to prove that updating its features to the present day will lead to regional revitalization, Because it contains valuable suggestions for local problems, and at the same time proves the power of design, it is very meaningful to introduce in our journal, and it is important to know not only Japanese people but also foreign people. I thought it would be an opportunity to receive it. In the Iwasaki district of Yuzawa City, Akita Prefecture, there is a brewery of miso and soy sauce that has been operating since 1867. 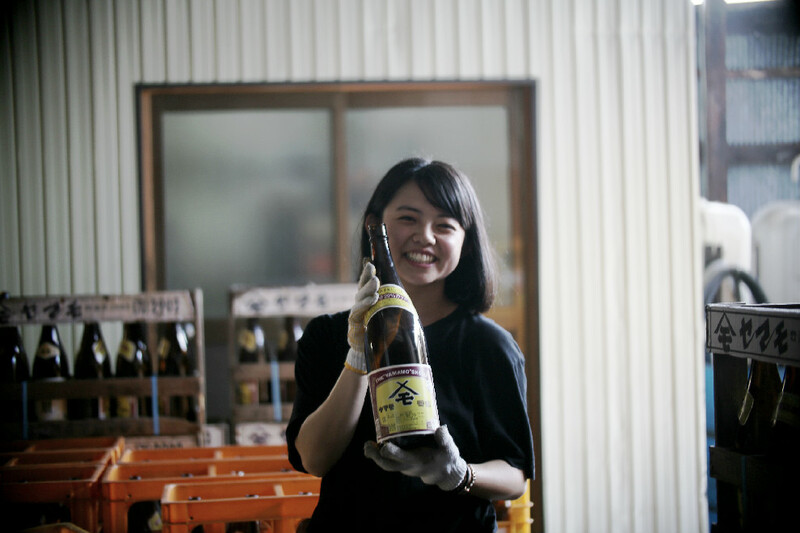 The long-standing Yamamo miso and soy sauce brewing company (hereinafter Yamamo) has engaged in natural brewing using subsoil water from the local river Minasegawa. While carrying on that tradition, Yamamo is extending its markets overseas by providing information on its website in English and Chinese in addition to Japanese. 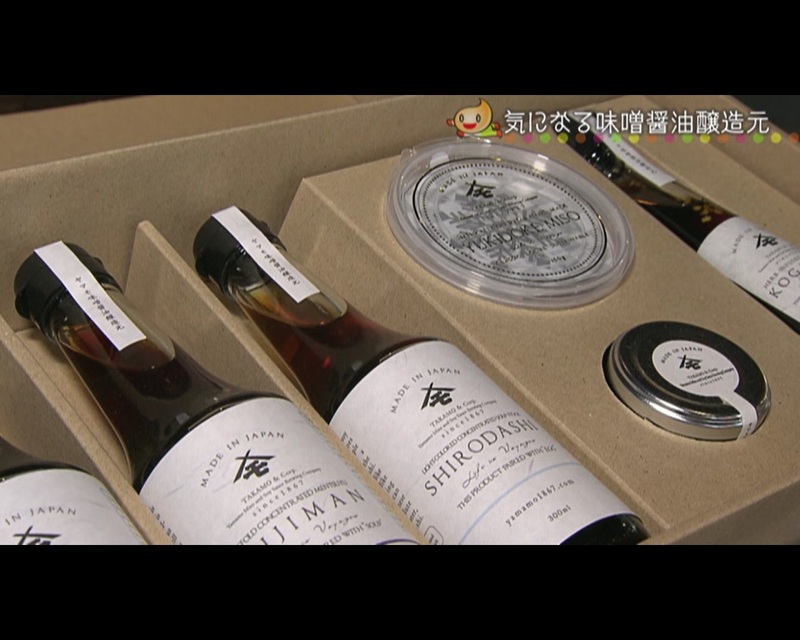 With its corporate activities to convey the attractiveness of the Japanese brewing industry both at home and overseas, Yamamo was selected as one of the company to win the Vibrant HABATAKU SMEs 300 of the Small and Medium Enterprise Agency and the Ministry of Economy, Trade and Industry’s Driving Company for the regional future. This was part of a new management strategy which the 7th President Yasushi Takahashi set forth. 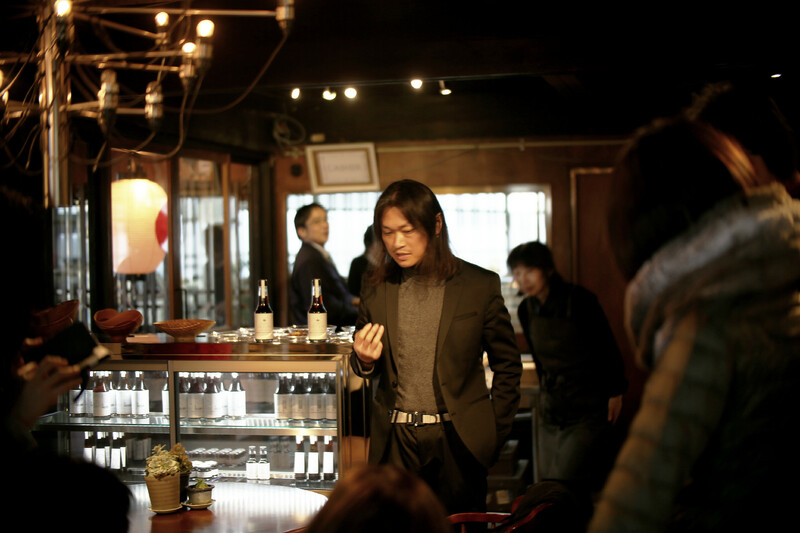 After studying zymurgy at the Tokyo University of Agriculture, he received training at a major brewing company and then took over its management. Takahashi originally wanted to become an architect and learned design engineering at Chiba University. 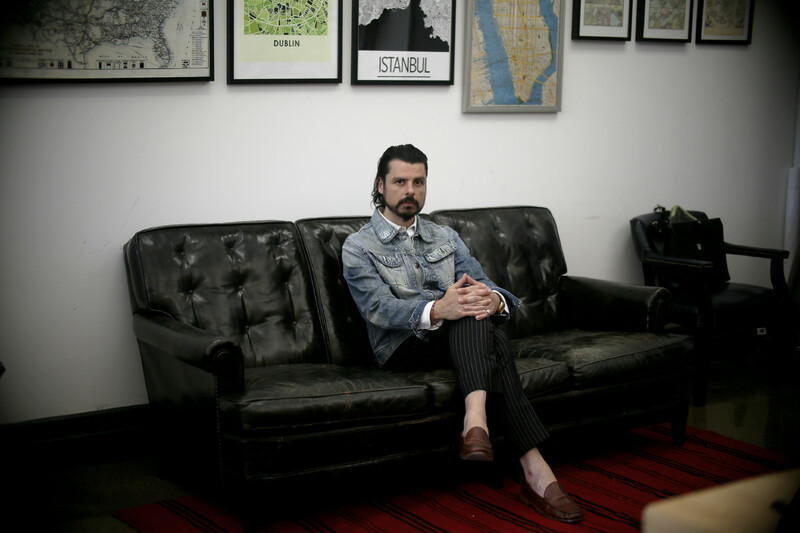 He exercised his remarkable sense of design from the first year as executive managing director, and worked on the branding of the company’s products. He started out with the updating of the company’s brochure and labeling of Yamamo products. Its products with the simple design earned the 2013 Good Design Award. 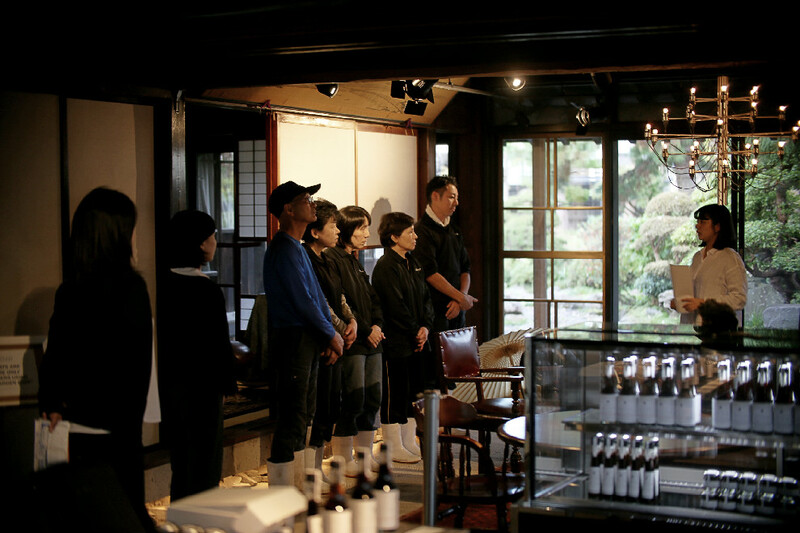 Takahashi also refurbished the brewing house and the garden. Passing through a noren curtain of the entrance of the brewing house, a comfortable space spreads before your eyes within a classy Japanese interior that incorporates the Western-style beauty. Outside the window, a magnificent Japanese garden awaits. The Reifu-nomori forest behind the brewing house serves as a beautiful setting of the garden. Takahashi’s exquisite aesthetic sense is well represented in all of them. In 2016, he started offering a tour that takes visitors through the brewing house and the garden. 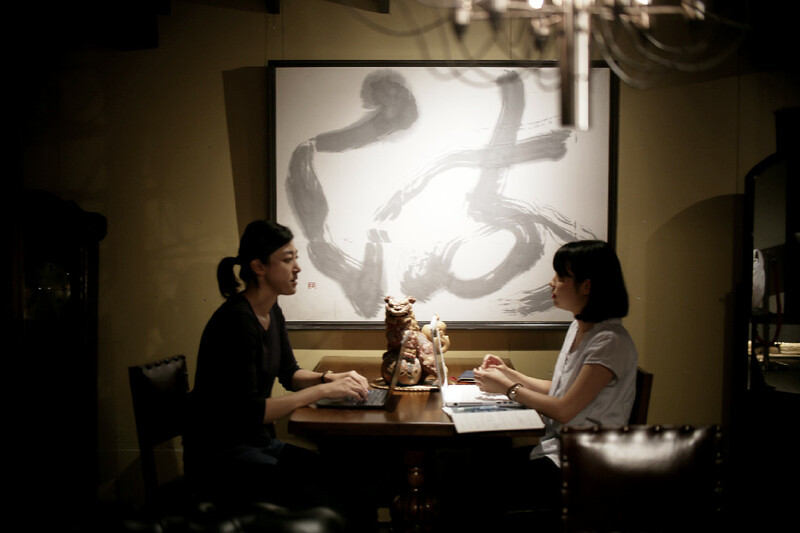 Fluent in English, Takahashi personally guides foreign visitors. The tour conveys the history of the brewing house, brewing techniques and the attraction of its industry, including the natural features of the district. The tour is serving as an important tool to experience a unique regional culture of Yuzawa City. 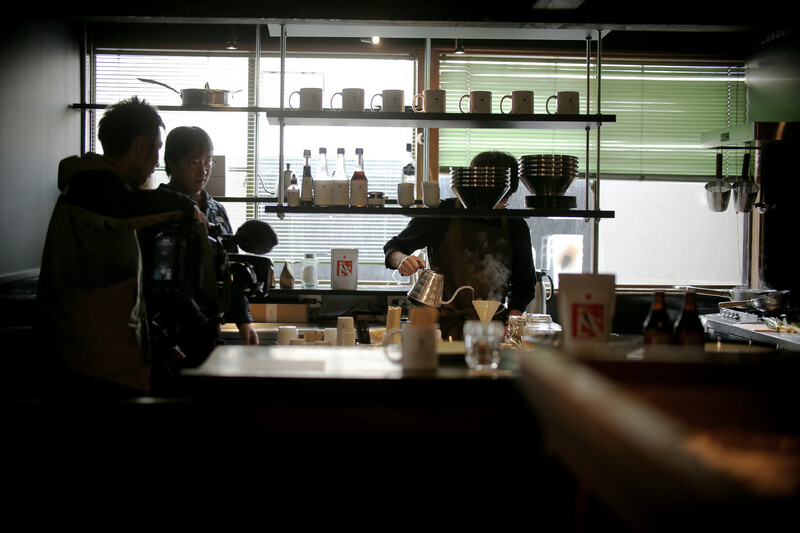 Recently, Yamamo opened a café in the brewing house. 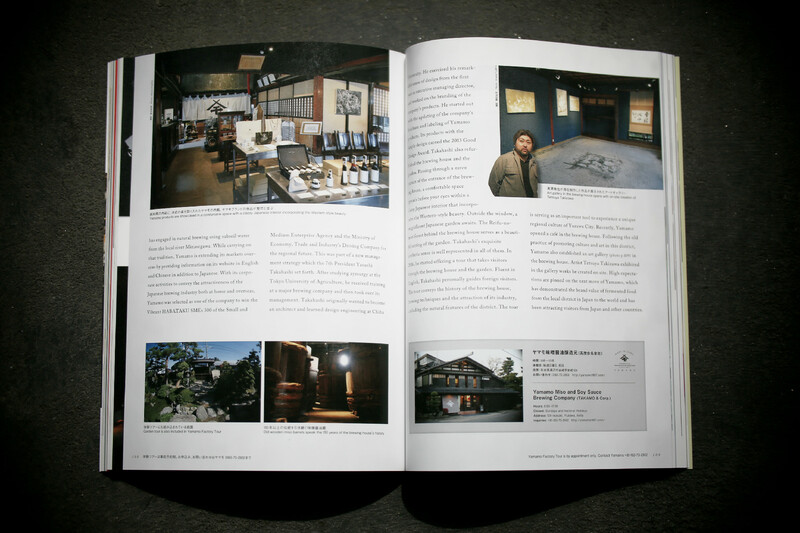 Following the old practice of promoting culture and art in this district, Yamamo also established an art gallery (photo p.109) in the brewing house. Artist Tetsuya Takizawa exhibited in the gallery works he created on site. 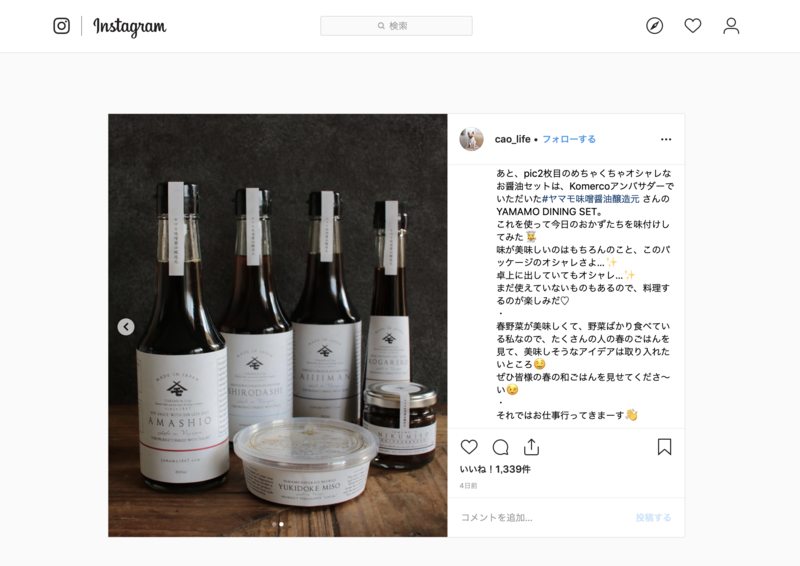 High expectations are pinned on the next move of Yamamo, which has demonstrated the brand value of fermented food from the local district in Japan to the world and has been attracting visitors from Japan and other countries. “ONBEAT” is a complete Japanese-English bilingual book, published twice a year at the same time as a print edition and an electronic edition, introducing Japanese art and culture from a wide variety of genres. In addition to large-scale bookstores such as Kinokuniya Bookstore and Yodoya Bookstore through the Japanese edition and Touhan, it is also sold at museum shops such as the National Art Center, Tokyo National Art Museum and the Tokyo Metropolitan Art Museum. It is also sold at overseas bookstores through a daily overseas business with sales networks in more than 78 countries. 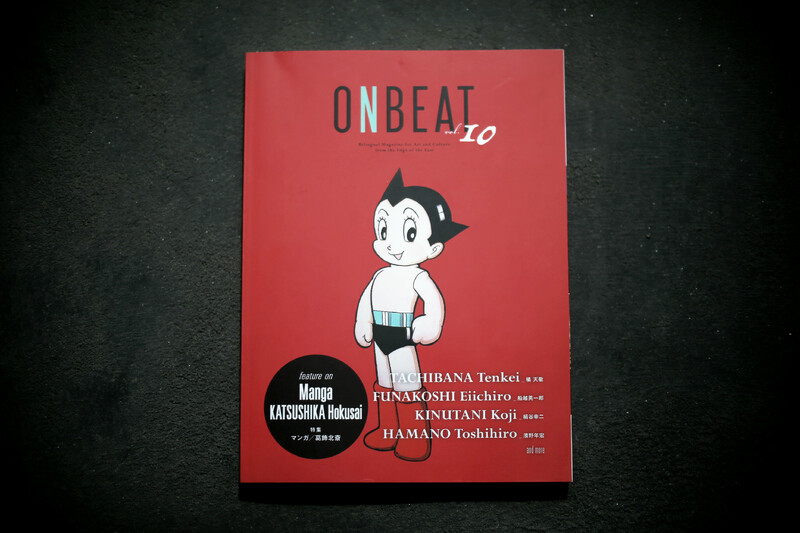 In “ONBEAT” magazines, artists such as Senju Hiroshi, Takashi Murakami, Miwa Komatsu, Yuji Inoue, as well as leading artists from Japan, as well as Tadao Ando, ​​Issei Miyake, Hiroko Koshino and Junko sisters, Nobel Prize in Physiology and Medicine, etc. We did exclusive coverage to celebrities and released special feature articles. There are no other magazines that introduce Japanese art and culture in complete Japanese-English parallel writing, and they have received high acclaim overseas as well, such as the Sainsbury Institute for Japanese Arts and Sciences (UK), Japan Society (US, UK), and the International Cultural Center. It is stored in prestigious research institutes specializing in Japanese culture, libraries of various educational institutions such as Women’s Art University and Tamagawa University, and Roppongi Hills Library. In addition, the lounges and libraries of large-scale passenger ships such as The Ritz-Carlton Tokyo and Hilton Tokyo, as well as foreign-owned hotels such as Nippon-maru and Pacific Venus are always on hand.